Flash Global is a leading provider of global service supply chain solutions that specializes in the high tech industry. Supply chain and logistics marketing can often times be dry and boring but Flash works hard to set the brand apart with non-traditional marketing. Schaefer concepted an integrated social campaign and contest that would include pre, during, and post show marketing tactics. 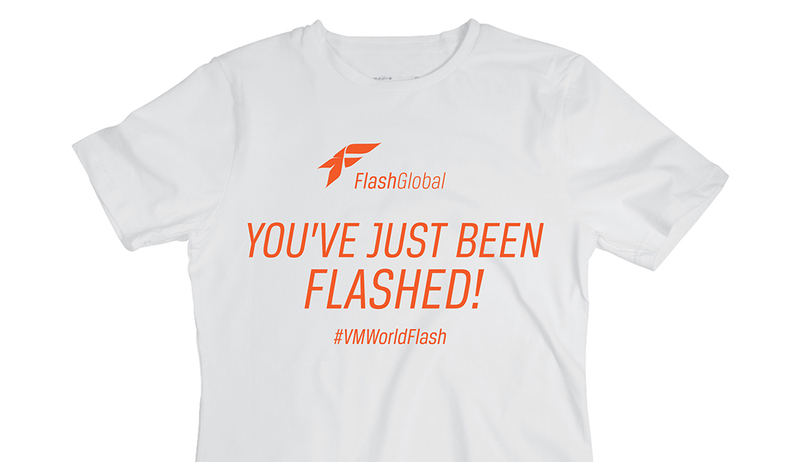 The overarching campaign concept was predicated on the theme of “Flash Flashers”, a branded street team that would surface at the VM World event. 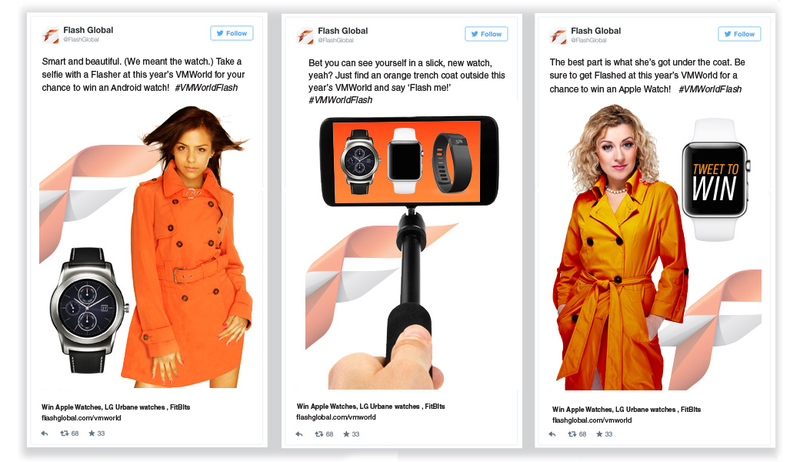 Prior to the event, the Flash team teased the Flash Flashers campaign with a number of social posts, eblasts and sponsored Twitter ads that were directed toward a specific list of VM World guests. In addition, the team hosted a subject-specific Twitter Chat focused on timely supply chain topics particularly relevant to the high-tech audience at VM World. 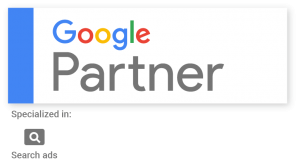 Flash received very strong metrics from their eblast efforts. On opening day of the event the Flash Flashers, (purely fun, and rated “G”) were positioned outside of the Moscone Center where VM World was hosted. 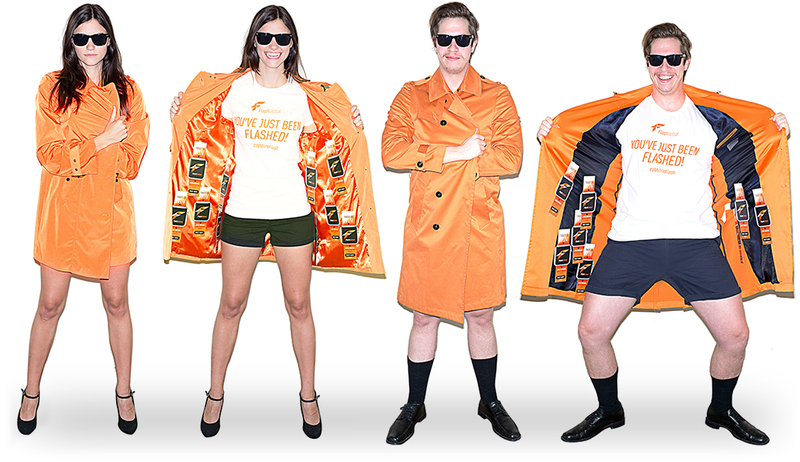 While canvassing the streets, The Flash Flashers were outfitted with bright orange trenches, showcasing the brand’s signature color. 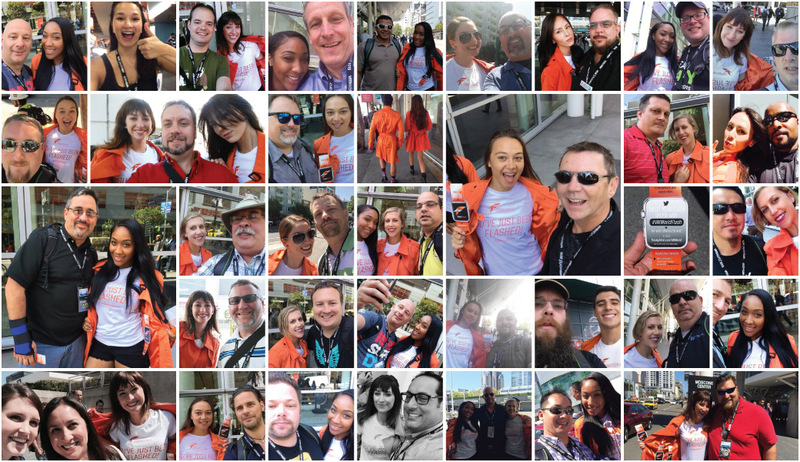 The high energy crew made the most of their tour by encouraging tweets for #VMWorldFlash, as well as handing out selfie sticks, flash collateral and fake apple watches that invited the recipient to enter to win real Apple and Android prizes. 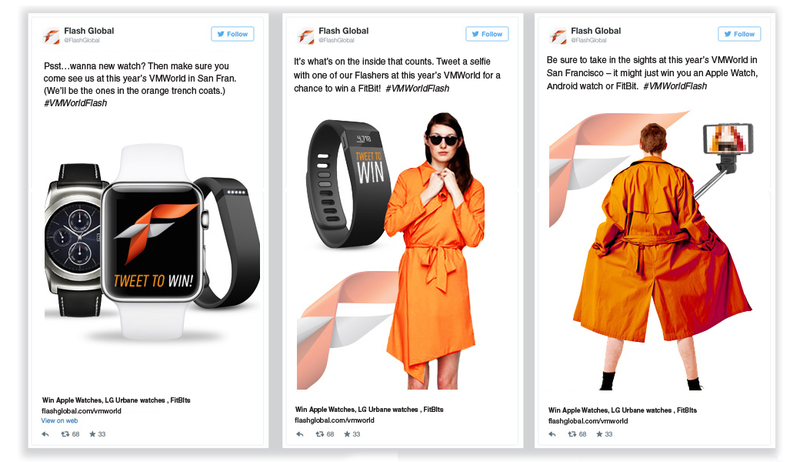 Throughout the event the Flash team promoted socially on both LinkedIn and Twitter, using organic posts, blog posts, and twitter cards to further encourage engagement. 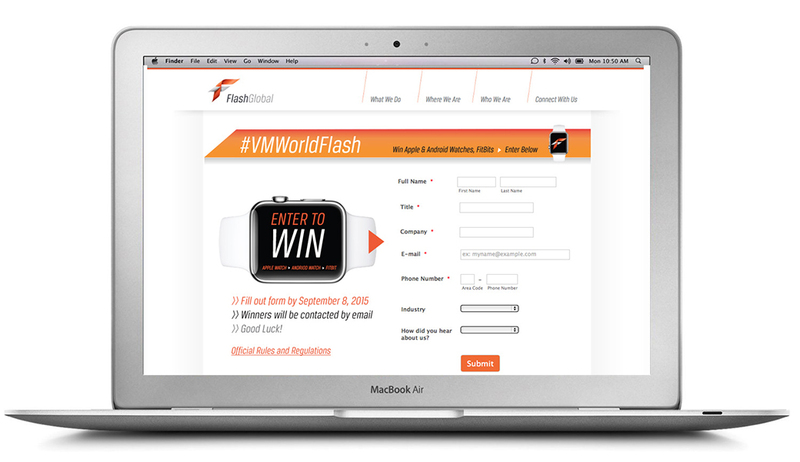 To further promote the Flash Flashers, and the Apple and Android prizes, a campaign landing page was crafted. A key feature of the landing page was a Twitter social feed, in gallery format, allowing viewers to see all posts in real time. Additionally, participants who were not current Twitter users, could utilize this page as an alternative way to enter the contest by filling out the on-page form and subsequently were added to the Flash database. 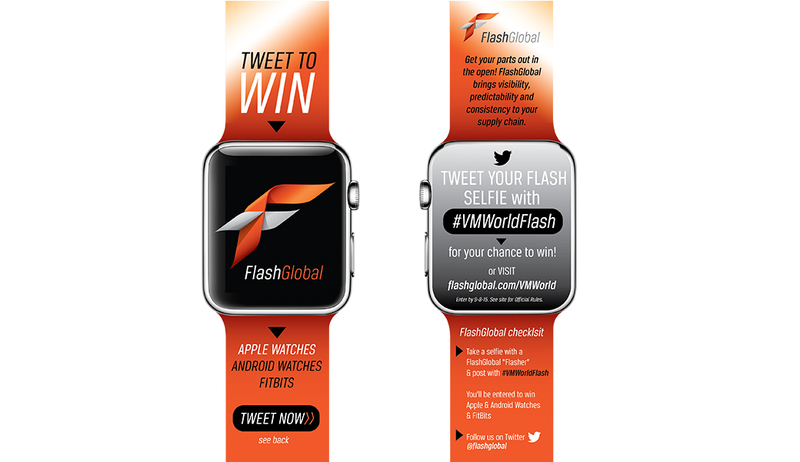 As a result, Flash Global carved out a noteworthy presence outside the show, building an experiential relationship with prospects and setting a tone for a brand that is on the cusp of significant growth.